Your Recerational Vehicle purchase represents a major investment. Entrust your vehicle repairs to the experts. 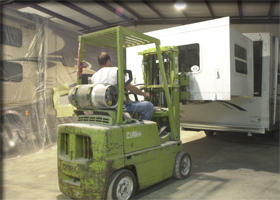 Our RV repair facility is specifically equipped to perform major recerational vehicle repairs. Scissor Lifts provide a working platform that can be elevated to roof top level thus allowing our technicians a comfortable working arrangement for roof top and air conditioning repairs. 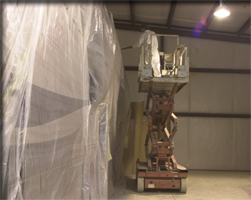 Our fork lifts provide a safe and efficient method for slide out repairs. Slide Out seals often develop leaks over time which can lead to interior damage. Let Washburn Engineering replace those aging seals and protect your investment. Not ever dealership or repair shop has the equipment necessary to do a full vehicle restoration. If a leak should develop, it is often necessary to replace rotten or damaged spars or other wooden sturctures. We have a fully equiped wood working center and we have the ability to replace internal wooden structures as needed. Your recerational vehicle purchase represents a mojor investment. Entrust your recerational vehicles to the recerational vehicle repair experts. �2009 Washburn Engineering. All rights reserved. Information appearing on this site has been produced by or obtained primarily from Washburn Engineering Website Design by Cook Media Group, LLC.